The Pace Bend Mountain Bike Race and Festival is Saturday-Sunday, March 24-25, at Pace Bend Park, 2011 Pace Bend Road, located at the traffic light just east of the Texas 71 bridge over the Pedernales River. SPICEWOOD — The term “mountain biking” is deceiving in that mountains aren’t necessary. In fact, the Highland Lakes and Central Texas boast some incredible mountain biking opportunities even though our elevations pale in comparison to the Rockies and the Appalachians. What the region lacks in “mountain” trails, it makes up for in technical trails. These types of trails feature rugged terrain, ledges, rocks, trees, and other challenging obstacles. If you’re not a mountain biker, or unfamiliar with the sport, you might not realize the number of riding opportunities that exist in the Highland Lakes — with more on the way. A good first lesson on the sport is the Pace Bend Mountain Bike Race and Festival on Saturday-Sunday, March 24-25, at Pace Bend Park, 2011 Pace Bend Road, located at the traffic light just east of the Texas 71 bridge over the Pedernales River. There is a $10 (cash-only) park access fee, but you can watch the race for free. 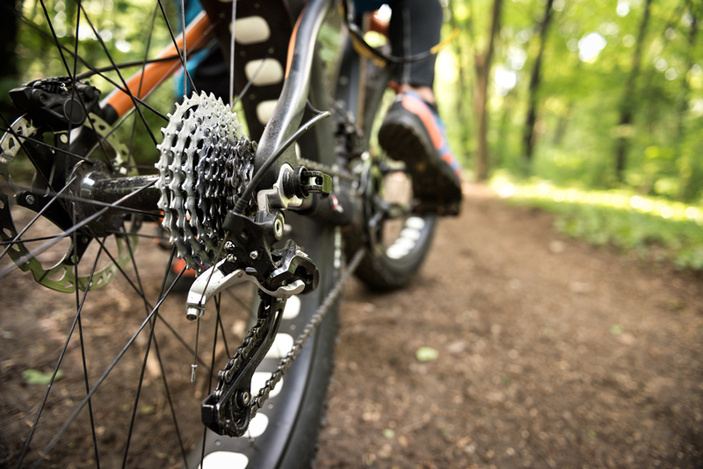 Of course, if you’ve never hit the mountain bike trails before, you probably shouldn’t register for the race, but it’s a good opportunity to learn about mountain biking and see how blessed the area is with trails. Browning described the Pace Bend Park race as one of the most challenging on the Texas Mountain Bike Racing Association series. On Saturday, the kids and youth divisions compete starting at 2:30 p.m. with the 10-and-under followed by the 12-and-under at 3 p.m.; 13- and 14-year-olds at 3:30 p.m.; and 15- to 18-year-olds (as well as Fat Bike Races) at 4:30 p.m. On Sunday morning, the expo and festival get into full swing with the adult and pro categories races. The first race takes off at 8:30 a.m., and the last one hits the trail at 1 p.m. The event is a great opportunity to ask questions and learn about mountain biking. Browning said one thing he loves about the sport is the supportive, community atmosphere, both on the trail and at races. Browning described mountain biking as a chess game in which a rider must think ahead as they approach a trail feature. How are they going to navigate this field of rocks? How are they going to climb that hill with knotty tree roots guarding the trail? How are they going to handle this ledge or drop-off? Browning said Central Texas has a good selection of mountain biking trails from easy, crushed granite paths to extremely technical ones that challenge even the most experienced riders. In the Highland Lakes, riders can hit the trails at Pace Bend Park, Reveille Peak Ranch (105 CR 114 in Burnet), Muleshoe Bend Recreation Area (2820 CR 414 in Spicewood), Colorado Bend State Park (2236 Park Hill Drive in Bend), and Pedernales Falls State Park (2585 Park Road 6026 in Johnson City). The Austin Ridge Riders have been instrumental in developing a number of trails in these parks. Browning added that landowners are also discovering the benefits of mountain biking, and hiking, trails. Many studies have shown that when people move to a community, or consider moving to an area, something they seek out is a good trail system. If you think mountain biking is something you’d like to try (don’t fret about your age because Browning knows riders in their 70s), a good way to start is to meet up with riders with skills similar to yours. The Austin Ridge Riders host regular rides during which they divide participants into skill-level groups. Browning also recommends you get a properly fitted bike built for the activity. Most big-box or discount store mountain bikes that you can purchase for a couple of hundred bucks aren’t going to cut it. You might have to spend at least a $1,000 for a decent entry-level mountain bike, but the technology and workmanship that go into a good bike pays dividends on the trail. A great place to learn about the sport is the upcoming Pace Bend Mountain Bike Race and Festival. Go to austinridgeriders.com for more information. For more Highland Lakes races, check out our guide. Bicycles should not be allowed in any natural area. They are inanimate objects and have no rights. There is also no right to mountain bike. That was settled in federal court in 1996: http://mjvande.info/mtb10.htm . It's dishonest of mountain bikers to say that they don't have access to trails closed to bikes. They have EXACTLY the same access as everyone else -- ON FOOT! Why isn't that good enough for mountain bikers? They are all capable of walking.... A favorite myth of mountain bikers is that mountain biking is no more harmful to wildlife, people, and the environment than hiking, and that science supports that view. Of course, it's not true. To settle the matter once and for all, I read all of the research they cited, and wrote a review of the research on mountain biking impacts (see http://mjvande.info/scb7.htm ). I found that of the seven studies they cited, (1) all were written by mountain bikers, and (2) in every case, the authors misinterpreted their own data, in order to come to the conclusion that they favored. They also studiously avoided mentioning another scientific study (Wisdom et al) which did not favor mountain biking, and came to the opposite conclusions. Those were all experimental studies. Two other studies (by White et al and by Jeff Marion) used a survey design, which is inherently incapable of answering that question (comparing hiking with mountain biking). I only mention them because mountain bikers often cite them, but scientifically, they are worthless. Mountain biking accelerates erosion, creates V-shaped ruts, kills small animals and plants on and next to the trail, drives wildlife and other trail users out of the area, and, worst of all, teaches kids that the rough treatment of nature is okay (it's NOT!). What's good about THAT? To see exactly what harm mountain biking does to the land, watch this 5-minute video: http://vimeo.com/48784297. In addition to all of this, it is extremely dangerous: http://mjvande.info/mtb_dangerous.htm . For more information: http://mjvande.info/mtbfaq.htm . The common thread among those who want more recreation in our parks is total ignorance about and disinterest in the wildlife whose homes these parks are. Yes, if humans are the only beings that matter, it is simply a conflict among humans (but even then, allowing bikes on trails harms the MAJORITY of park users -- hikers and equestrians -- who can no longer safely and peacefully enjoy their parks). The parks aren't gymnasiums or racetracks or even human playgrounds. They are WILDLIFE HABITAT, which is precisely why they are attractive to humans. Activities such as mountain biking, that destroy habitat, violate the charter of the parks. Even kayaking and rafting, which give humans access to the entirety of a water body, prevent the wildlife that live there from making full use of their habitat, and should not be allowed. Of course those who think that only humans matter won't understand what I am talking about -- an indication of the sad state of our culture and educational system.